Louis Edmund Blaze who was an educationist par excellence, founded Kingswood College, Kandy (KCK) in the year 1891 with just 16 boys. His school, then known as Boys' High School was located in Pavilion Street. He started this school because Blaze wanted to make his dream become a reality, by founding a school that was quite different from the schools that existed in Ceylon at the time. The traditions he established in Kingswood were not to be found in any other. Blaze's memories linger on as fresh as when he lived, not only in the minds and hearts of those who worked with him during his illustrious career as the Founder and first Principal of KCK, but also in the minds and hearts of thousands of students who had the privilege of studying at Kingswood during his stewardship and thereafter. Blaze was born on September 29, 1861 as the fifth child to a respectable Burgher family which valued education. Several of his kinsmen were distinguished teachers or professionals. Both his paternal grandparents were teachers; grandfather being the Headmaster at Government Boys' School in Payagala whilst his grandmother was the Headmistress at the Government Girls' School also at Payagala. Two of his brothers were eminent lawyers. He had his secondary education at Trinity College, Kandy. While at Trinity he started a school magazine which appeared in manuscript form on May 15, 1876 and later came out fortnightly as The Gleaner. In 1880, at 19 years of age, he passed the first examination in Arts of the University of Calcutta. On passing this examination, he was appointed as the Headmaster of the Lower School of Trinity College. After a short period, he resigned from this position with the intention of pursuing a career in Law. But his heart was not in the legal profession. The inspiration of his grandparents may have influenced him to decide otherwise. In 1882, he became the first graduate from Trinity College when he obtained the Bachelor of Arts degree from the University of Calcutta. Having obtained the degree, he did a stint of teaching at Bishop's College and St. James School in Calcutta, the profession he was destined to continue. Blaze returned to Ceylon in January 1891. Now he had a very keen desire to start a school of his own choice where the friendliest of relations would prevail between teachers and students, where boys would really be educated in the right atmosphere and not merely trained to pass exams. Against all odds, Blaze founded the school of his choice on May 4, 1891 naming it the Boys' High School, housed in a small building in Pavilion Street, with only 11 boys. Numbers did not remain low for very long. The very rapid growth of the school made it necessary to move the school to more spacious premises in Brownrigg Street towards the end of 1897. In 1898, the school took the name of Kingswood College. Having learnt the finer points of the game whilst in India, Blaze taught his students to play Rugby Football. This was one of Blaze's earliest achievements as an educationist. Later, Trinity College, his alma mater took to the sport, and the first schools' rugby match was played between Kingswood and Trinity in 1906. This historic match between Blaze's old school and the school he founded ended in a draw, each team scoring two tries. Blaze was interested not only with the welfare of the pupils in school, but also that of those who passed out. Thirteen years after founding Kingswood, Blaze established the Kingswood Union on September 30, 1904 with himself as its first President. Immediately after the school sports meet in 1904, a meeting was held and the Kingswood Union was formed with 44 members. Blaze was unanimously elected the President with EH Spencer as the Secretary and WI Samaraweera as the Treasurer. Since that time the Kingswood Union has been functioning without a break. That the largest number of volunteers for service among old boys of Ceylon schools during the First World War came from Kingswood College bore ample testimony to the loyalty and manliness imbibed by Blaze into his pupils. Kingswood College had a number of traditions established by Blaze. The most significant of these is the reciting of the Prologue at the annual Prize Giving of the College. Until a short period before he passed away, Blaze himself used to write out the Prologue. Later it was entrusted to an old boy. The other striking tradition was addressing the boys of Kingswood College as gentlemen of Kingswood. This set a standard for the boys to live up to, and certainly all who have passed through the portals of Kingswood have done so. 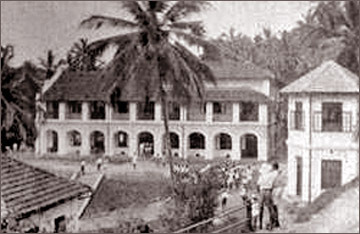 It was in the year 1925 that Kingswood College moved into the premises presently occupied by the school at Randles Hill, on the Kandy-Peradeniya Road. This was made possible by the very generous gift given by Sir John Randle, MP at Westminster and a distinguished Wesleyan Methodist, though Kingswood College was little known to Sir John at the time of his donation. It was on December 31, 1923 that Blaze severed his official connection with Kingswood College when he retired from the position of Principal at the age of 62 years. He wrote two books on the history of Ceylon, produced an anthology of poems on Ceylon entitled 'In praise of Sri Lanka' and wrote several academic papers such as 'Ceylon in English Literature' and 'Ceylon and Some Great Names' which were his contributions to the Dutch Burgher Union Journal. He also found time to edit the 'Ceylon Independent' newspaper and also wrote 'KFE', the book on the history of Kingswood College. He relinquished the editorship of the 'Ceylon Independent' to accept the position of Principal of Prince of Wales College, Moratuwa for a short time. He was a member of the General Committee of the Dutch Burgher Union, having been a member of the Union from its inception in 1908. Blaze had the good fortune to be present at both the Golden Jubilee in 1941 and the Diamond Jubilee in 1951, of the wonderful school he had founded. Eight days after the Diamond Jubilee prize giving Blaze passed away on August 4, 1951, a few weeks before his 90th birthday. Blaze undoubtedly and indisputably stands out as a colossus and shines out as pre-eminent. He was undoubtedly one of the greatest scholars and thinkers this country has produced and all of us are thankful to him for his foresight in founding one of the best, if not the best school in Sri Lanka.